Oh snappy. I forgot to write a post for Friday and haven’t been home the entire weekend, so sorry you guys had to wait so long for and update! I am really happy to read the positive notes on my last few posts. There’s one more episode in my Closet Cleaning series to come, and for me, it’s the most exciting one! You’ll see why soon. I couldn’t have had a better weekend. The weather was more than amazing and K and I took a pleasurly break from studying on Thursdaynight and friday. Yes friends, we had a 4 day weekend. Oh, how I love those! We strolled around Antwerp and I kinda sorta broke my shopping ban at Forever21. We also had delicious pizza and K surprised me with a stop by my favorite chocolate bar. He sure knows how to treat a lady! Furthermore, I fried my brain by spending waaaay to much time behind my computer screen, trying to summerize a few of the “smaller” books I have. All this studying and staying inside has effected my dressing in a bad way. I am having a complete style-rut and not even Pinterest can get me inspired these days! 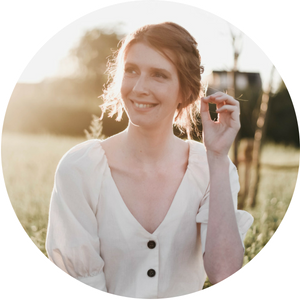 What’s a blogger to do? Why ofcourse, stop complaining and summerize some more. Hope to see you guys again on wednesday! PS: This fence is quite the popular backdrop… check here. Previous Post Closet Cleaning: Keep it clean! Love the casual feel, but the blazer takes it to the next level, nicely done. Sounds like you had an amazing weekend, good luck with the rest of your summaries! A chocolate bar sounds delicious! And you, miss, look amazing. Casual outfits are my favorite, 'cause I am a total jeans girl!!! loving your infinity scarf! also i'm glad to hear you had such a great weekend! hurrah : ) xo. 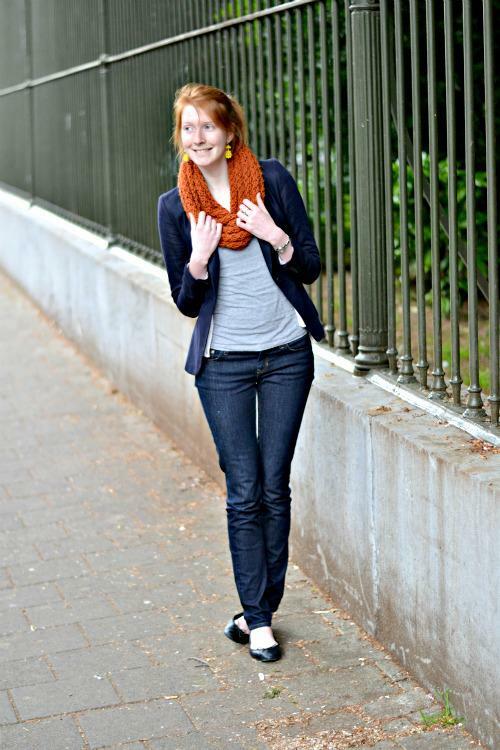 I love the scarf and the casual outfit is really nice! I wish I lived where you live. And I love those colours together. It's a casual outfit, but you're all class. This color combo is so great, and you look chic and comfy at the same time! Check out my latest post, I promise you will fall in love with florals, you'll see! 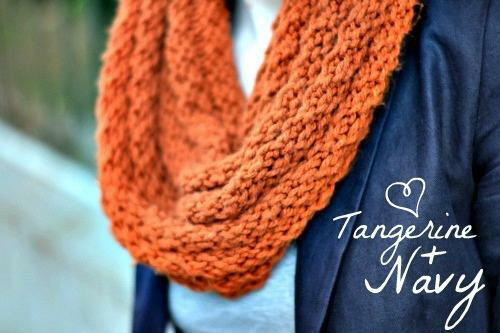 I loved the blend of tangerine + navy! I hope your visit there on my blog! So cute! Love the blazer! The scarf and earrings are the perfect finishing touches! What a beautiful scarf! It looks lovely with your hair & with that blazer! Love your outfit! That scarf is the perfect compliment to the inky denims! Great outfit my dear! Gee the weather must be really nice over where you're at I couldn't imagine wearing a scarf we don't even have air conditioning at our place! 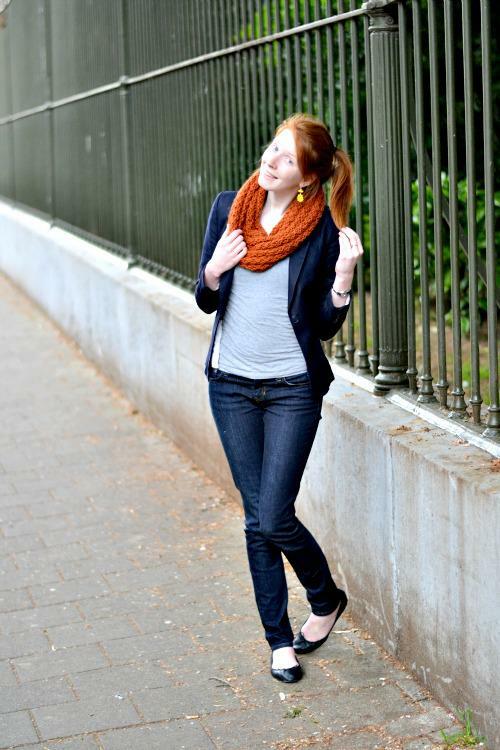 cute casual look, love the tangerine and navy combo. Love these colors, you look adorable. And it sounds like your weekend was amazing. C for casual but also for cute! Cute outfit! I love those infinity scarves, they're so easy. Obsessed with that color combo! da's aan mijn school getrokken! cool 😀 blauw staat zo leuk met u haar!